The Casual Restaurant Critic visits SOMA. In Chelem. 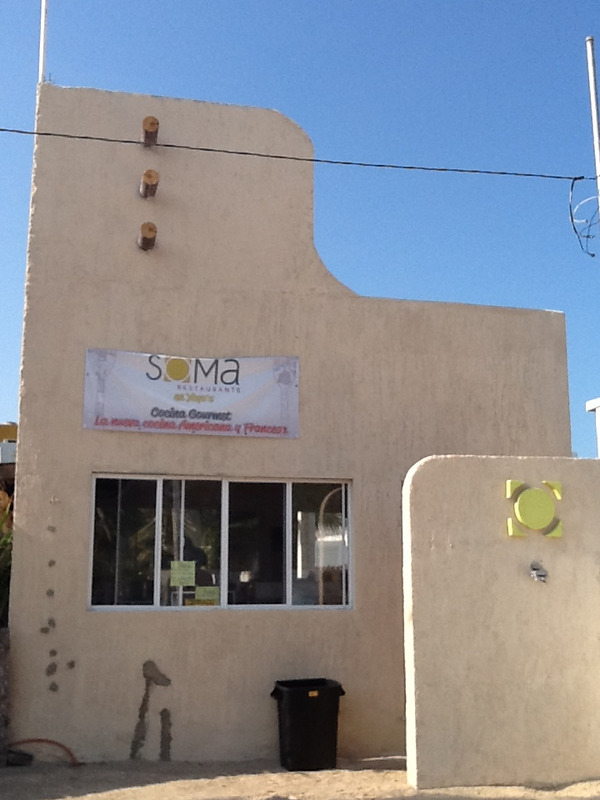 A quick internet search for SOMA will result in websites for lingerie, drugs, a record company and a magazine, among others but to find SOMA the restaurant you will have to go to Chelem. Yes, Chelem, right here in the Yucatan. The Casual Restaurant Critic had heard about this restaurant from some food-loving NYC refugees who now make their home in Chuburna and so, in the company of his lovely Better Half visited SOMA after a day of lying around the beach in Chuburna. This same feeling came back last night, when the Critic and Better Half received a bread basket with crunchy/chewy real bread, heated and served with a pat of fresh butter in a colorful little dish, followed by the appetizers. Appetizer one was a salad – what a miserably sparse word for the work of art that appeared on the plate. 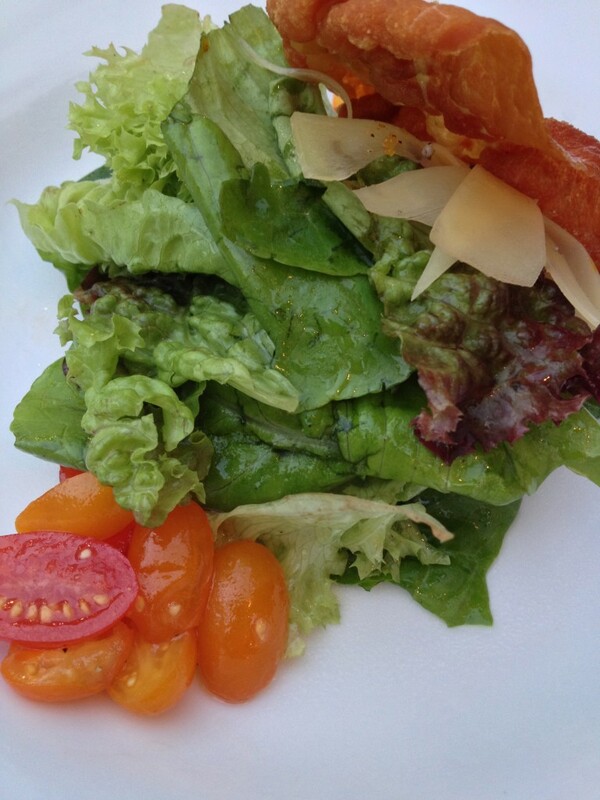 An assortment of lettuce(s), some baby/cherry tomatoes, a touch of cheese and a rasher of pork belly fried bacon-crisp on top not only looked beautiful but each mouthful was an experience. Appetizer two was grits. Now, to a former Canadian who is not accustomed to such delicacies, the thought of grits was less than appealing, especially after having seen pans of unappetizing-looking grits in Houston restaurant buffets , but thanks to the mention of this particular appie by a certain New Yorker, the Critic said what the hell. And these are not bland, gunky grits. 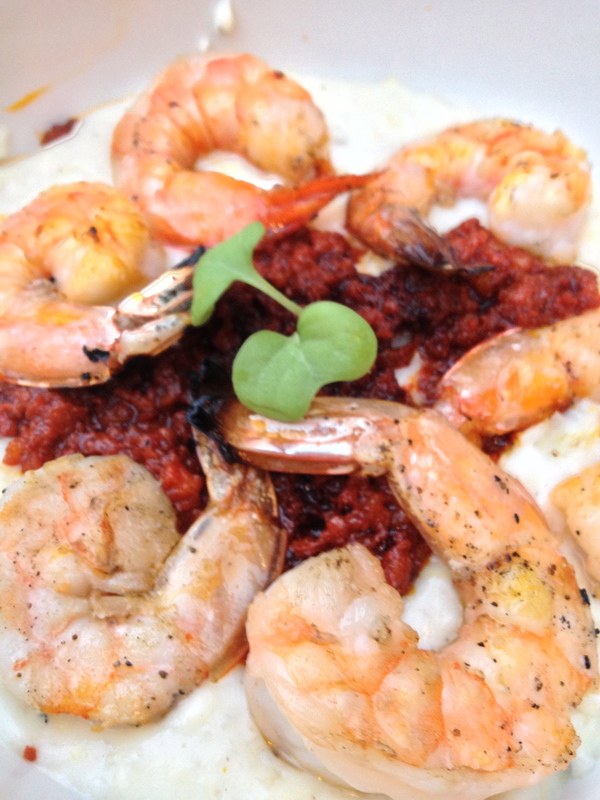 They come with a sprinkle of smoky chorizo and a quintet of perfectly grilled shrimp lying suggestively on top of those grits. The combination is remarkable as the creamy texture below combine with the chorizo and the shrimp. Thumbs up for the grits! The Critic and Better Half looked at each other and thought – are we in CHELEM? The main courses were as good or better than the appetizers. 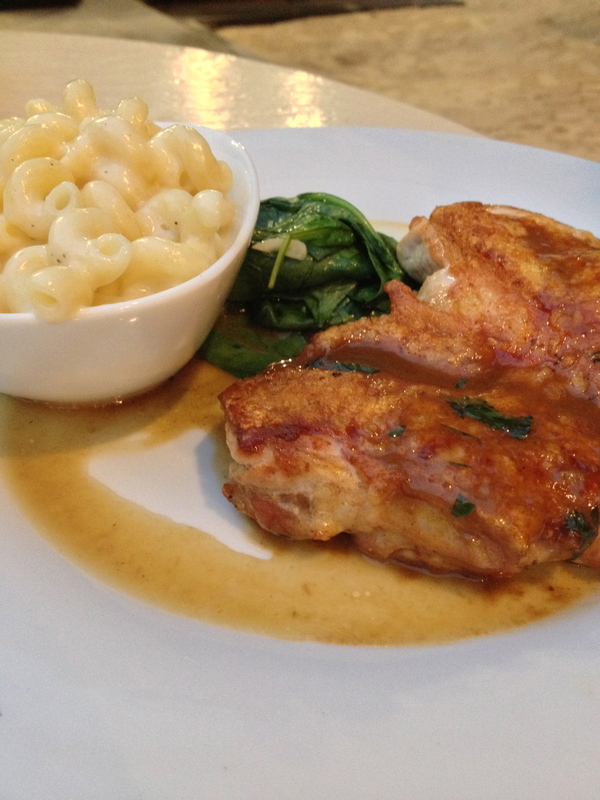 Better Half ordered a grilled chicken which, when ordered anywhere else could have been a dry lump of white meat, charred to the point of dried boredom, was instead perfectly seasoned, crispy on the outside and juicy on the inside, and accompanied by a little pot of home made macaroni and cheese, which would make Kraft blush in embarrassment. 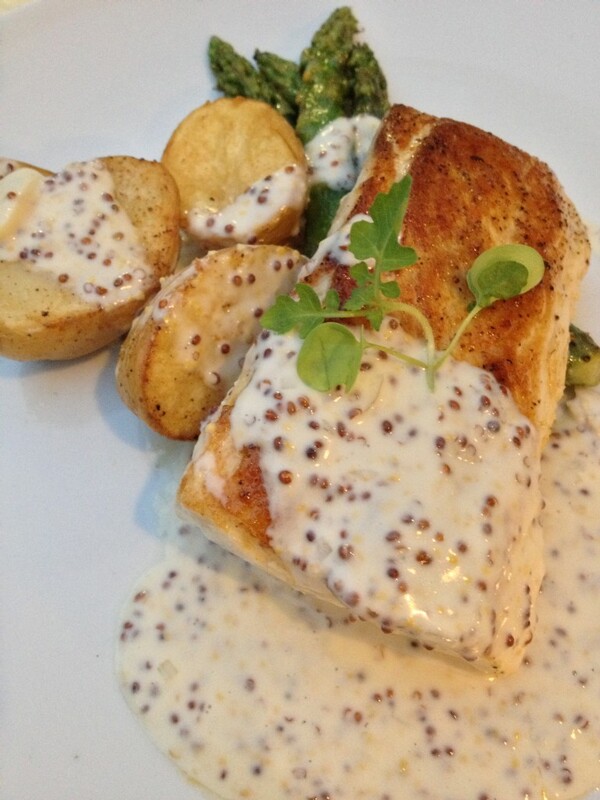 The Critic ordered the fish (esmedregal en español) filet, perfectly cooked atop steamed fresh asparagus and served with crunchy baby potato halves. Scrumptious. At this point, there was no going back and the Better Half and Critic decided that of the two dessert items on the menu… both had to be tried. 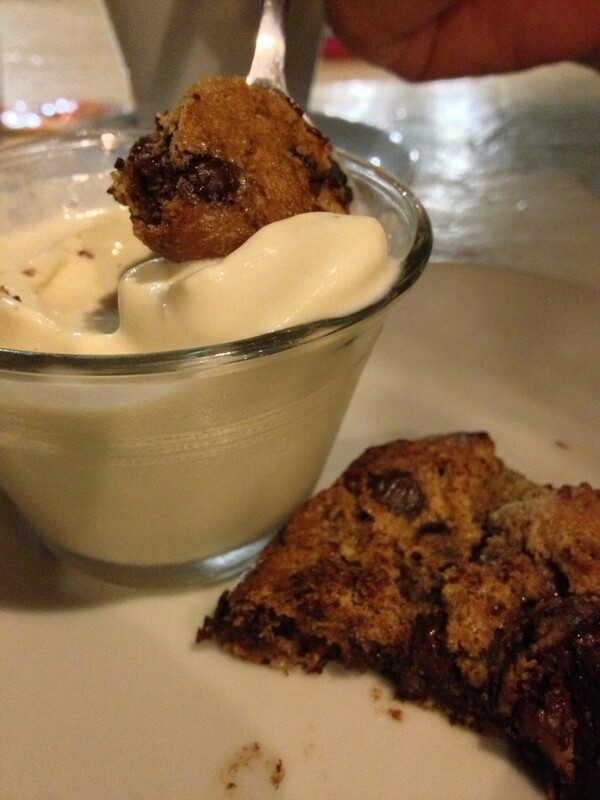 The chocolate chip cookie is unbelievably perfect: crunchy and chewy and hot as in fresh baked right then and served with a little bowl of Haagen Dazs vanilla ice cream. 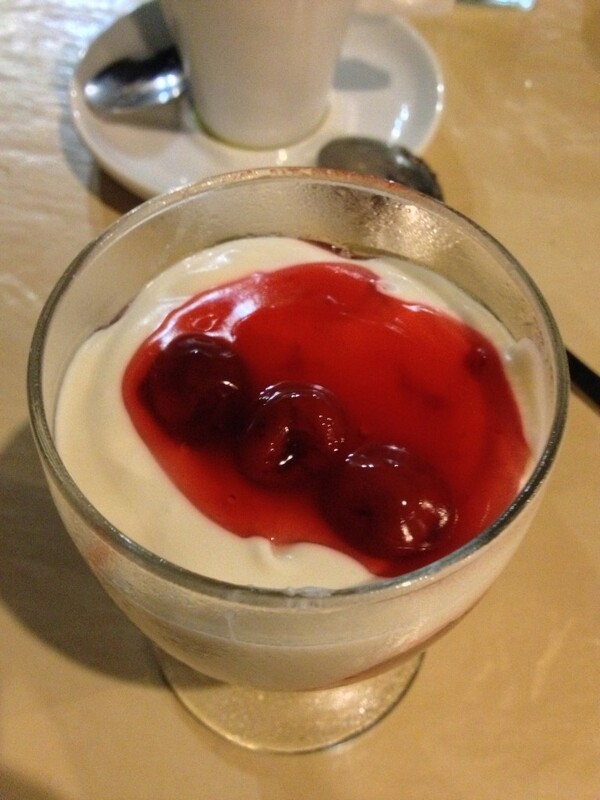 The other option was a cheese-cake with cherries – in a glass! Delicious as well and washed down with a real cup of coffee and a cup of hot chai latte. 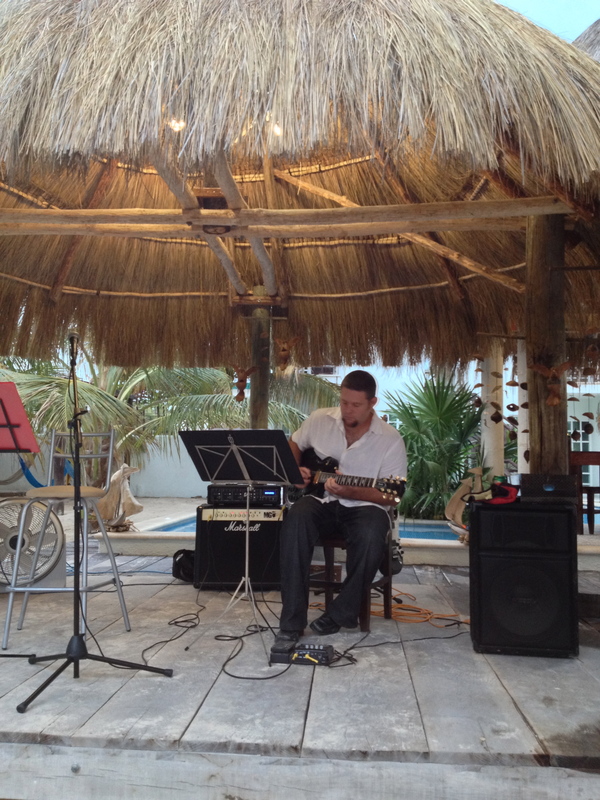 As it was Saturday, the restaurant was full and there was live music to entertain diners – a guitarist accompanying a husky voiced woman singing romantic songs in a parse, jazzy style that made the evening perfect. So how was the service, you ask? Excellent. Lindy, the gracious owner personally looked after her guests with help from a pleasant young man and young lady while her husband/artist Alberto worked his magic in the kitchen. There is no liquor license and yet, the other tables were enjoying glasses of wine from bottles that mysteriously appeared from knapsacks and coolers they had brought along. Enjoyable review and lovely photographs. Is it appropriate to inquire about the cost of this meal? Thank you Stan, of course. 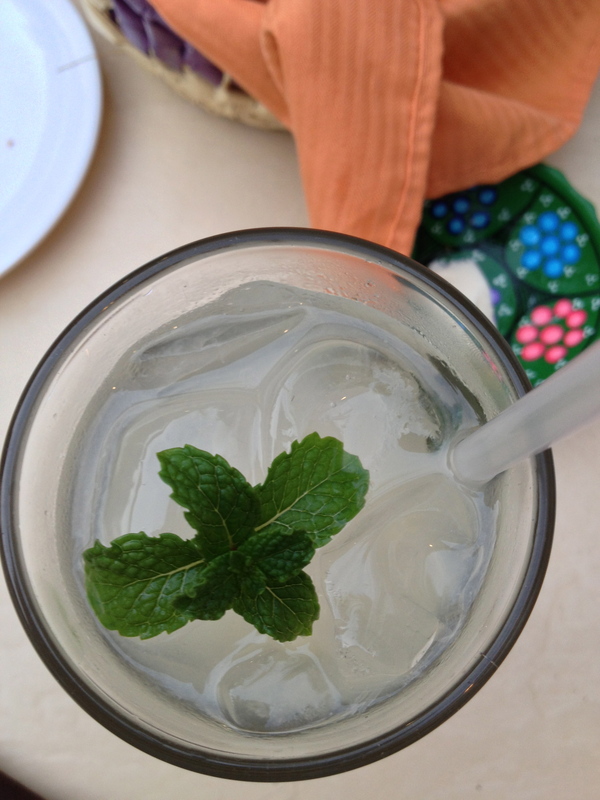 The meal, along with 2 lemonades each, came to $620 pesos. Appetizers are all in the 5-7 dollar range while main dishes run 10-15 dollars. Thanks for your comments! Can’t wait to try brunch! Give me a number and we’ll call, for sure! Wow! Thank you so much! It was such an honor to meet you and Maru. We look forward to seeing you again soon! Love your website! Thanks to you guys for existing and raising the bar for restaurants in the area! Nor can I. I am salivating just thinking about it. See you Sunday! It certainly is worth the drive, from Merida even. I used to think that Elio al Mare was worth it until the horrendous service on one occasion turned me right off. This is the new “worth the drive” destination for a great meal with warm and gracious service. THanks for commenting! I agree with you guys! I was having dinner there for my wedding anniversary on April 18th and it was amazing! Food, atmosphere, attention, all!! They made our anniversary a special one! We were so pleased, I wrote a very good critic in TripAdvisor!! It is a very special little place, Ileana – let’s tell everyone!